This article is about the avoidance of drugs and alcohol. For other uses, see Sober (disambiguation). "Clean and sober" redirects here. For the 1988 film, see Clean and Sober. 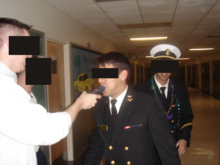 A midshipman is subjected to a random breathalyzer test to determine whether he is sober. Sobriety is the condition of not having any measurable levels or effects from alcohol or drugs. Sobriety is also considered to be the natural state of a human being given at a birth. A person in a state of sobriety is considered sober. In a treatment setting, sobriety is the achieved goal of independence from consuming alcohol. As such, sustained abstinence is a prerequisite for sobriety. Early in abstinence, residual effects of alcohol consumption can preclude sobriety. These effects are labeled "PAWS," or "post acute withdrawal syndrome." Someone who abstains, but has a latent desire to resume use, is not considered truly sober. An abstainer may be subconsciously motivated to resume alcohol consumption, but for a variety of reasons, abstains (e.g. a medical or legal concern precluding use). Sobriety has more specific meanings within specific contexts, such as the culture of many substance use recovery programs, law enforcement, and some schools of psychology. In some cases, sobriety implies achieving "life balance." Sobriety may refer to being clear of immediate or residual effects of any mind-altering substances. Colloquially, it may refer to a specific substance that is the concern of a particular recovery support program (e.g. alcohol, marijuana, opiates, or tobacco). "Clean and sober" is a commonly used phrase, which refers to someone having an extended period without drugs or alcohol in their body. Since these tests rely on cooperation of the subject, the final result often depends on the presiding officer's interpretation. There are many factors that can lead to inaccuracies in sobriety testing including orthopedic or neurologic conditions, and fatigue. ^ "WHO - Lexicon of alcohol and drug terms published by the World Health Organization". www.who.int. ^ ""Scientific grounding for sobriety: Western experience." MD Basharin K.G., Yakutsk State University" (PDF). ^ "Field Sobriety Tests". Retrieved 7 July 2011. ^ "Georgia Walk and Turn Test". ^ "How Police Test for Marijuana DUI in California". Randy Collins. Retrieved 28 March 2019.